Do a search for 1055 Budapest, Szent Istvan krt. 1. in Google Maps. Note how I spelled Budapest correctly in my search, now look at what Google returns as the spelling in the ballon marker. You got that right, Google spelled it with an extra "e" at the end, "Budapeste." 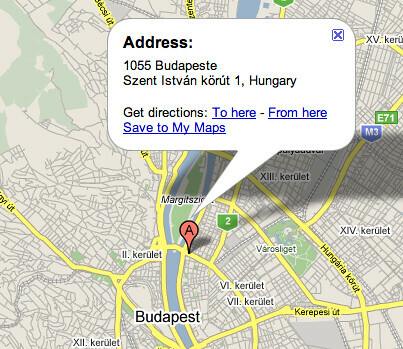 Looking closer, it really doesn't seem like Google doesn't know how to spell the capital of Budapest. See the map above? I zoomed out and it shows the correct spelling of the capital under the white bubble, overlaid on the lower portion of the map. However, the street address, which is also spelled Budapest, is spelled with an extra "e."
Maps Guide Adam in Google Groups said the issue will be fixed shortly. A similar issue was reported in the country of Serbia, the city of Sremska Mitrovica is spelt wrong, "Stremska Mitrovica." That too will be fixed shortly.